I suppose Dyson�s music will have made it when CD liner-notes omit reference to the composer having written the grenade manual for the British Army during the Great War. That day has not yet come. Dyson�s At the Tabard Inn, drawn from his massive Canterbury Pilgrims choral work, is a glorious comedy overture in the English Rabelaisian tradition. On the international stage comparisons can be made with Colas Breugnon, with Till Eulenspiegel and with Stenka Razin. This pilgrim�s cavalcade is ribald and touching; gentle and rough-and-tumble. It is more naturally recorded without the gorgeously contrived impact of the recent Chandos reissue. The horns whoop out over the finally galloped bars in this exciting performance. The Concerto da Chiesa emerges a much more impressive work than it appeared on Hickox�s Chandos CD a decade and more ago. The music is dignified and yet touchingly affecting in the Veni emmanuel movement. The work breathes the religious passion of the Tallis Fantasia with the emotional impact of Suk�s Wenceslas Chorale. A memorable feature is the poignant work of the solo string quartet. The resonances touch on the reverential Tallis and the plunging ardour of Elgar�s Introduction and Allegro. Dyson ends the piece with freshness avoiding the all too easy hackneyed choices facing any composer struggling to end a work. David Lloyd-Jones shaves several minutes off Hickox�s time for Dyson�s one and only Symphony. The approach and the orchestral tone is leaner - more athletic. However Hickox�s grip on structure is better in the rambunctious yet fragmented first movement which overall has a Korngold-like effusion as well as the occasional Sibelian moment. In both the central movements Lloyd-Jones finds echoes of Elgar�s Enigma Variations as well as the oft-mentioned reminiscences of Rimsky-Korsakov and Borodin. He makes a much better sustained job of the impressive second movement. In the finale we return to the Russian influences - listen to Dyson at play with Rimskian brilliance from 4:43 onwards. This is a symphony different in mien from the other 1930s examples: Moeran, Walton 1 and Bax 6 yet serious enough and certainly varied and provocative. The strings of the Bournemouth Symphony Orchestra are not a voluptuous luxury item. They tend to stiffen tone under tension and this lends a psychological edginess to the proceedings. This leanness can be compared with the plush and sleek tone captured on Chandos. Chandos are at mid-price while Naxos are in their accustomed bargain bins. Neither disc will leave you feeling short-changed and both make for rewarding listening. Chandos offer a chance to hear the choral Dyson. In that sense that disc is more representative. 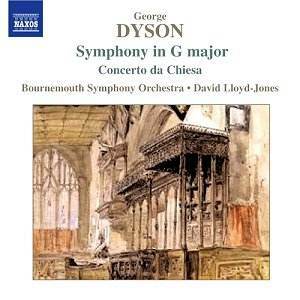 However David Lloyd-Jones and the Bournemouth Orchestra make something very special of the Concerto da Chiesa and the other pieces here are really very well done.